Why do displays for your Welcome Centers have to be overly designed, stuffy, and outdated the moment you print them? Three cheers for our clients who've chosen to install chalkboards and use them in fun, purposeful ways in their daily campus visits! They're modern, timeless, and, again, FUN. Boring elevators are so 1853. If you're in the midst of a remodel, renovation, or looking to tackle an easy aesthetic issue, take a cue from our client James Madison University. Recently, they moved into a new space. 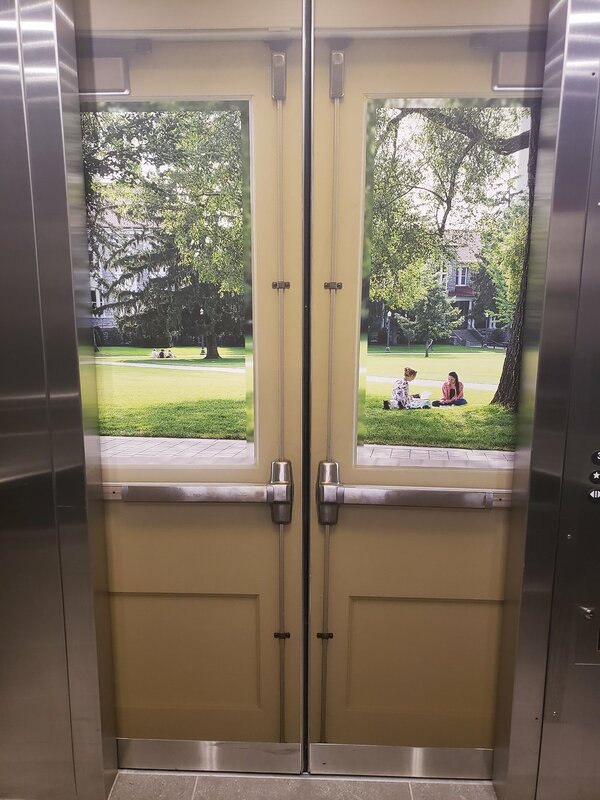 They took advantage of blank space on elevator doors by wrapping them with campus landscapes to make it feel as though you were exiting into campus. Bonus: They have both a summer and winter edition to help guests understand JMU experiences all the seasons. How do you use your elevators to help showcase campus and tell stories? Tag us on Facebook, Instagram, Twitter, or your blog with #renderthevisit. Let's face it: our faces point down when walking these days. Mostly because we're all walking with a supercomputer in our hands. So why do we keep putting up expensive wayfinding on signage? Many businesses and colleges are moving to sidewalk graphics and paint to make announcements and get visitors where they need to be. Can you start using your sidewalks more? Ever sat in the lobby of a doctor's office? Us too. It's quiet, uncomfortable, and the only noise you typically hear is the shuffling of magazines and papers. Breaking this quiet is tough. Music, good furniture, ambassadors and staff floating in the lobby, and good hospitality can all help. But getting families to converse with each other/breaking the ice is the toughest part. Recently, we were at a restaurant where conversation starters were stamped right into the table. They were provocative, funny, and definitely broke the ice. What can you do to help start conversations between families? Yes, I'll have a side of feelings with my burger. We recently shared an article through our monthly Render Raves about the power of belonging and how consumers are looking for brands which align with their values. A much larger conversation we're starting to have is - what does this shift in consumerism mean for higher education? On a tactical level, what does this mean for the daily campus visit? How can you share and showcase your institutional values and invite your prospective families to share in those? Last year, Jeff Kallay and I visited the Bill and Melinda Gates Foundation Discovery Center in Seattle, WA. There is a really great display showcasing the Foundation's values and chosen social issues to support. After experiencing the center, the final piece is to acknowledge what you learned and are inspired to do for our global community. It's easy, fast, and allows you to see all the stories and pledges from people who shared your values. How are you showcasing institutional values and capitalizing on the power of the shared experience? Also, is this not the coolest use of sun/shadow? "Where is the restroom?" It's often the very first question from visitors when they arrive to your office. So many of us are in spaces with inadequare restrooms/stalls for the number of visitors we're seeing. Should you be guiding visitors to restrooms even before they arrive to your space? Are there buildings with much better facilites on the walk from a parking garage/lot to your office? Consider this sidewalk sticker found in Greenville, SC. Can you use this same concept to help guide visitors to restrooms close by?